Kaa the python and Bagheera the panther. 1924 illustration by the French artist Maurice de Becque. "Kaa's Hunting" is a short story by the British author Rudyard Kipling. It was originally published in two parts in the March 31 and April 7, 1894 issues of the magazine Today. It is also included in Kipling's 1894 anthology The Jungle Book. The story concerns Mowgli, a 7-year-old human boy who lives in the Indian jungle and has been raised by wolves, Mowgli's friend and protector Bagheera the black panther and Mowgli's teacher Baloo the bear. The plot is set in motion when monkeys, creatures that all of the other jungle animals despise, abduct Mowgli because they hope that he can teach them how to build shelters out of wood. Moving through the treetops, the monkeys soon take Mowgli out of sight of both Baloo and Bagheera and carry him far away. In order to rescue the boy, Baloo and Bagheera have to ask for help from Kaa the python because Kaa is the only animal of which the monkeys are afraid. The events of "Kaa's Hunting" take place during the time period covered in "Mowgli's Brothers" and before those of "Tiger! Tiger!" Animated cartoon adaptations of The Jungle Book from the United States, the Soviet Union and Japan all feature storylines in which Mowgli is abducted by monkeys, as in "Kaa's Hunting". 1895 illustration for "Kaa's Hunting" by John Lockwood Kipling, Rudyard Kipling's father. The action takes place in a jungle in India. Baloo the bear is responsible for teaching the Law of the Jungle to wolf cubs. That means that he also has to teach the 7 year-old human boy Mowgli, who has been raised by wolves and lives among them. Baloo finds Mowgli an excellent student. Whereas the wolf cubs are only interested in the parts of the Law that apply directly to them, Mowgli takes much more interest in it and has a much greater capacity to learn. This pleases Baloo because he feels that, as a human, Mowgli is much more vulnerable and in much greater need of protection than his regular students are. Bagheera the black panther, who considers Mowgli to be his pet, sometimes comes to watch parts of Mowgli's lessons. Bagheera is not happy that Baloo beats Mowgli when he forgets something. Baloo insists that he only beats Mowgli softly and that he only does it for the boy's own good, saying, "Better he should be bruised from head to foot by me that love him than that he should come to harm through ignorance." Baloo tells Bagheera that he has been teaching Mowgli the Master Words that will protect him from all predators and that he can use to ask for help from other jungle dwellers. The bear gets Mowgli to repeat those words to the panther. Mowgli says the phrase, "We be of one blood, ye and I", in bear language (which all four-footed predators understand), bird language and snake language. Baloo proudly says that nothing can hurt Mowgli now. Referring to people, Bagheera quietly says that the boy's own tribe could. Mowgli tries to get Bagheera's attention. He then begins shouting something about becoming the leader of his own tribe, swinging through the trees and throwing branches and dirt at Baloo. From Mowgli's words, both Baloo and Bagheera realize that he has been talking to monkeys. Mowgli says that the monkeys took pity on him after Baloo beat him, gave him nuts and said that he would be their leader one day. Baloo tells Mowgli that the other jungle animals do not have anything to do with the monkeys because they are dirty and shameless, eat everything, have no laws, have no leaders and have no language of their own. Baloo adds that the monkeys are boastful. They always say that they are about to do great things but never do so because they are easily distracted and soon tire of things. Baloo says that the only constant desire of the monkeys is to be noticed by the other jungle animals. The other jungle animals do not give them that satisfaction by ignoring them and keeping apart from them. Mowgli takes Baloo's words to heart and resolves never to have anything to do with the monkeys again. Mowgli is abducted by monkeys. 1924 illustration by the French artist Maurice de Becque. It begins to rain. Baloo and Bagheera take Mowgli away and find shelter. The three go to sleep. Some monkeys follow them. The monkeys have decided that Mowgli would be useful to them because he knows how to make simple shelters out of wood, an instinct that the boy has inherited from his woodcutter father. The monkeys think that Mowgli could teach them to make such shelters and have decided to abduct him. 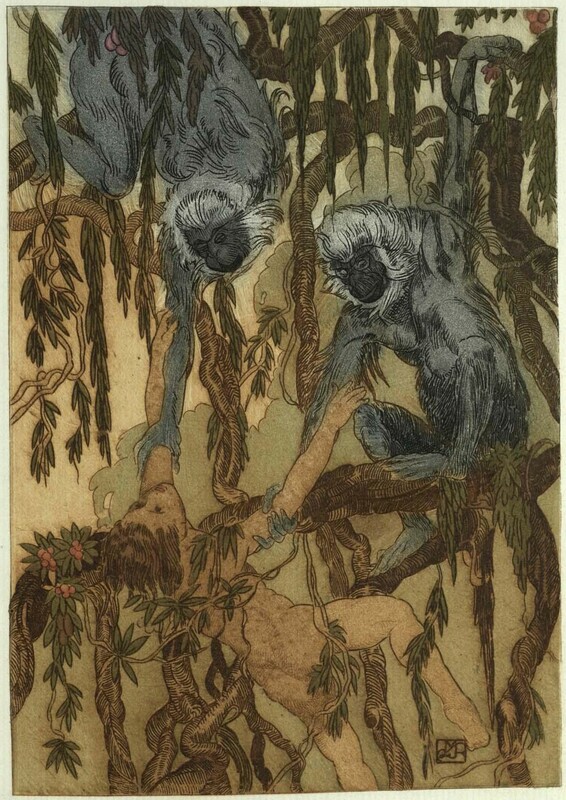 The sleeping Mowgli wakes up when he is grabbed by monkeys. He is taken up to the treetops and is soon carried far away before Baloo and Bagheera can do anything. Mowgli realizes that he has to get word of his whereabouts back to Baloo and Bbagheera. He sees a bird, a kite named Chii. Mowgli gets the kite's attention by saying in bird language the Master Words, "We be of one blood, thou and I." He then tells the bird to pay attention to where the monkeys are taking him and to let Baloo and Bagheera know. Baloo and Bagheera are greatly distressed by Mowgli's disappearance. They are worried that he might have been killed, the monkeys having tired of carrying him and dropped him. They have no idea where Mowgli is. They also doubt that they could get the monkeys to give Mowgl back if they knew where he was. That is because Baloo and Bagheera know that the monkeys are not afraid of any other animals. Baloo then remembers that there is one animal that the monkeys fear, Kaa the python. Kaa is able to climb trees and eats young monkeys. Baloo and Bagheera go off to find the snake. Since he is a python, Kaa is not a poisonous snake. Instead, he kills his victims by squeezing them to death. Kaa has just shed his skin, leaving him a little blind as a result. He is also a little deaf, like all snakes. Baloo and Bagheera greet Kaa with the words, "Good hunting." They tell him that they are hunting monkeys. Bagheera tries to get Kaa angry by telling him that the monkeys have called him, "Footless yellow earthworm." Kaa comments that it is strange for two great hunters such as Bagheera and Baloo to take an interest in monkeys. They are forced to tell the snake about Mowgli the human boy and ask Kaa if he knows where the monkeys might have taken him. Kaa says that he does not. He explains that he happily eats monkeys when they come his way. He does not, however, follow them because he pays no more attention to monkeys than the other jungle animals do. Chii the kite then appears. He tells Baloo and Bagheera that the monkeys have taken Mowgli to the ruined city. Bagheera says that the ruined city is half a night's journey away. He, Baloo and Bagheera begin the journey at once. 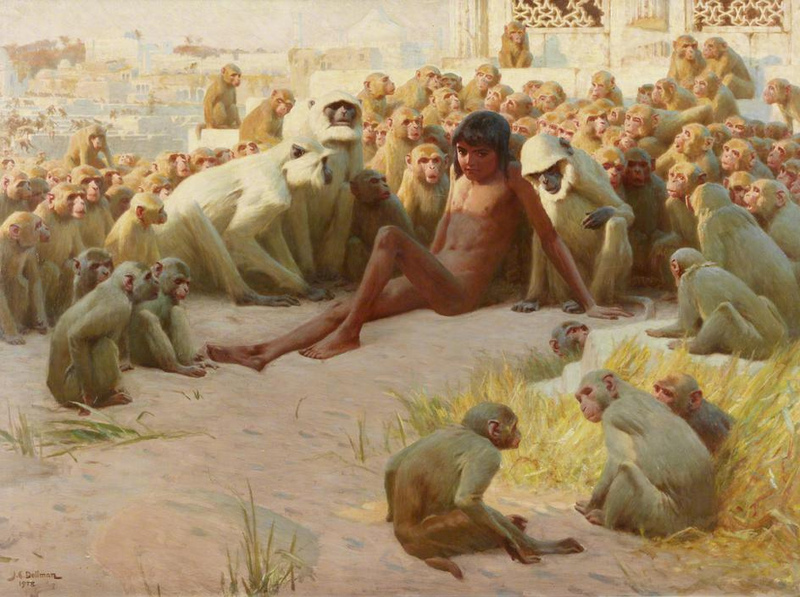 1903 painting by the British artist John Charles Dollman that depicts Mowgli among the monkeys. In the ruined city, a monkey announces that Mowgli is going to teach them how to build wooden shelters. Mowgli starts to build such a structure. The monkeys watch him intently at first. They soon lose interest, however, and start to jump about and pull each other's tails instead. Mowgli asks for food. Some monkeys go off to gather fruit and nuts. On their return journey, however, they start to fight with each other, drop what they have gathered and come back with nothing. Mowgli tries to leave but the monkeys make him sit down and listen to speeches that they make. Several monkeys all say that they are great and wonderful. They tell Mowgli that he must tell the other jungle animals that. Mowgli thinks that all the monkeys must have caught rabies and gone mad. At night, Kaa and Bagheera approach the ruined city. Baloo is not with them. He has fallen far behind because he cannot move as quickly as the snake and the panther can. It also takes Kaa a long time to go up the steps to the terrace where the monkeys are gathered. Consequently, Bagheera gets to the monkeys first. Bagheera begins to attack the monkeys. They are not, however, afraid of a single panther and fight back. Telling Mowgli that they will deal with him later, some monkeys take him and throw him through the hole in the domed roof of a white marble building. The fall would have killed most boys. Mowgli, however, having been raised in the jungle knows how to land safely on his feet. The building is filled with poisonous cobras. In the snake language, Mowgli says the Master Words, "We be of one blood, ye and I." The cobras immediately let Mowgli know that they will not hurt him. They tell him to keep still so that he does not hurt them with his feet. Looking through fretwork, Mowgli watches the fight between Bagheera and the monkeys. He calls out to the panther to roll into a nearby water tank where the monkeys will not follow him. Bagheera does as Mowgli says. Baloo appears. He also begins to fight the monkeys but they are not afraid of him either and fight back savagely. Kaa then arrives. The monkeys begin to flee in terror. When Kaa says a single hissing word, the monkeys are all put into a trance and they all stand perfectly still. Kaa asks where the human child is. Mowgli calls out. The cobras inside the building tell Kaa to get the boy out because they are afraid he will crush their young with his feet. After giving a warning to the cobras, Kaa begins to use his head as a battering ram to break some of the marble fretwork. Mowgli is freed. He runs to Baloo and Bagheera. They tell him to thank Kaa. Mowgli does so politely. Kaa speaks politely to Mowgli also, although he warns the boy that he may mistake him for a monkey and try to eat him some time. The sleeping Mowgli is taken back to his wolf pack by Bagheera and Baloo. 1915 illustration by the Swedish artist David Ljungdahl. The python tells Mowgli, Baloo and Bagheera to leave and not to watch what he is going to do next. Although they leave, they continue to watch Kaa anyway. Kaa begins a hypnotic dance. The monkeys begin to walk towards Kaa on his command. Mowgli is completely unaffected by the dance because he is human. He simply finds the snake's movements silly. Baloo and Bagheera, however, find the dance deeply disturbing and are almost hypnotized by it themselves. They both agree never to go hunting with Kaa again. Bagheera points out that Mowgli will have to be punished for the trouble he has caused. Baloo reluctantly beats Mowgli as softly as he can. It is, however, a severe beating which Mowgli takes without saying a word. After the punishment has been given out, Mowgli is forgiven. Bagheera tells the boy to climb onto his back so that he can be carried back to his wolf pack. Mowgli falls asleep on Bagheera's back and continues sleeping even when he is placed down next to his wolf mother. "Kaa's Hunting" inspired the segment in the 1967 Walt Disney animated feature film The Jungle Book in which Mowgli is abducted by monkeys and has to be rescued by Baloo and Bagheera. In the film, the monkeys are led by an orangutan named King Louie who hopes that Mowgli will teach him the "secret of man's red fire". King Louie is unusual among the major characters in Walt Disney's The Jungle Book in that he has no equivalent character in Rudyard Kipling's original Jungle Book short stories. It is repeatedly stated in "Kaa's Hunting" that the monkeys have no leader. Kaa the python appears in Disney's The Jungle Book as an antagonist who attempts to hypnotize Mowgli so that he can eat him. 2012 Russian postage stamp which depicts Akela the wolf, Baloo the bear, Mowgli and Bagheera the panther as they appear in the Soviet animated series Adventures of Mowgli. In 1968, "Kaa's Hunting" was faithfully adapted as the second of five 20-minute animated films that make up the series Adventures of Mowgli (Russian: Маугли; Maugli), produced by Soyuzmultfilm of the Soviet Union. In 1973, the five cartoons were edited together to create a single animated feature film. That feature film was dubbed into English and released direct-to-video in 1996. "Kaa's Hunting" was adapted as the fourteenth episode of the 56-episode anime series Jungle Book Shōnen Mowgli (Japanese: ジャングルブック 少年モーグリ; Janguru Bukku Shōnen Mōguri). The episode was first shown on TV Tokyo in Japan on January 1, 1990. ↑ In early editions of The Jungle Book, the bird is named Rann, the Hindi word for "battle". In later editions, the name is changed to Chii, the Hindi name for a kite bird. Text of "Kaa's Hunting" on Wikisource. "Kaa's Hunting" on the website of The Kipling Society.